Creativity has always been something she wanted in a job, says AUT alumna Lucy Brock who is now a senior creative strategist at independent creative agency Motion Sickness. “On any given day I can be found working on anything from writing a creative campaign strategy or a social media strategy, to shooting or directing content, writing reports, pitching ideas, buying media or meeting with a client. There’s always lots to do. She feels lucky to have worked for a number of successful New Zealand companies she admires, Lucy says. In addition to her work at Motion Sickness, Lucy is also using her skills to support newly created charity BRAVE. “BRAVE aims to raise awareness and educate young people on sexual violence in New Zealand. It's a topic that's not often talked about but it needs to be. One in three girls in New Zealand will be subject to an unwanted sexual experience by the age of 16, and one in five women will experience sexual assault as an adult. Young people are statistically at the highest risk of sexual assault. 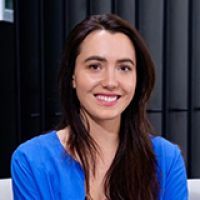 BRAVE was created in 2018 by fellow AUT communication studies alumna Jessica Tyson; a Māori Television news reporter and Miss World New Zealand 2018. She wanted a career that was both business oriented and creative, says Lucy who was supported by an AUT Vice-Chancellor Scholarship throughout her studies. Choosing where to study was easy, Lucy says. “AUT always appealed to me. I like that it’s such a progressive university with a foot in the real world, and an understanding of how things are changing and evolving. I also like that many of the academic staff work in the industry they teach about. Map out your dream career, Lucy advises other students. “Figure out who you really want to work for; whether it be the brand or business you admire, or the leader within an organisation that you aspire to be like. Then work backwards. Figure out the degree and the path that will help you get there. She is proud of what she’s achieved during her time at AUT, says Lucy who graduated in 2016.